There has been a lot of press leading up to the 50 billionth hand dealt at PokerStars – and with good reason. PokerStars paid out almost $1 million in cash prizes (not subject to clearing requirements) to celebrate this milestone on Wednesday. As the dust has settled, more details have surfaced recently about the winners of the promotion and the cash prizes that were rewarded both during and leading up to the 50 billionth hand at PokerStars. The winner of the 50 billionth hand was a German online poker player with the screen name tbvle. According to sources familiar with the player, he was known for playing hundreds of hands every day – a total of 290,000 different poker hands during the course of the last 18 months. At the 50 billionth hand, tbvle won the $26.00 pot with pocket Queens – taking home an automatic $50,000 bonus for winning the hand, in addition to other cash prizes awarded at the table. The 50 billionth hand at PokerStars was a big event. When the hand was dealt, all action taking place at other poker tables was temporarily stopped so that all of the players online could join the rail to watch the conclusion of the hand. During the hand, there were around 220,000 players participating in play at the site with 33,000 tables active. This was one of the highest site traffic peaks that PokerStars had seen during a weekday. At the winning table (Ornamenta), there were six players involved in the game – all of whom wisely stayed in the hand before the flop. Even though tbvle came away as the winner, the rest of the players around the table also received substantial cash prizes. In addition to around $3,000 being awarded to each player in the form of VIP Points, each player received a free entry into the $5,200 buy in World Championship of Poker Main Event. Players at the winning table were not the only players to receive cash prizes for the 50 billionth hand promotion. Starting at the 49.7 billionth hand, prizes were given out for 300 different hands leading up to the major promotion cash prize. 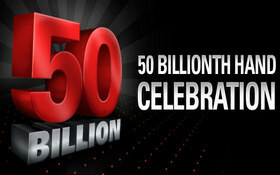 All in all, $952,239 was paid out to players participating in the 50 billionth hand promotion at PokerStars. This may have something to do with why so many consider PokerStars one of the best US poker sites around. This entry was posted on Wednesday, September 29th, 2010 at 3:04 pm and is filed under Poker News. You can follow any responses to this entry through the RSS 2.0 feed. You can leave a response, or trackback from your own site.